For a work related project, I wanted to run the Juniper vSRX firewall (v15.1X49-D110) on my work laptop by using VMWare Workstation Pro 14. Unfortunately, the installation (importing the Juniper vSRX OVA file resulted in a VMWare Workstation crash. The error 'Fatal Application Error: invalid vector<T> subscript (class std::out_of_range)' wasn't very helpful in determining what went wrong. Some Googling showed that there could be something wrong with the OVA file. But the problem wasn't generic, because the OVA deployed just fine on an VMWare ESX 6.5 host. NOTE: VMWare Workstation isn't officially supported by Juniper for running the vSRX software. 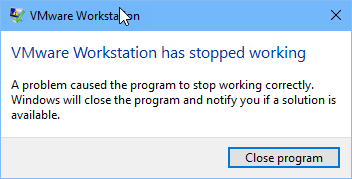 The actual error resulted in crashing the entire VMWare Workstation application (it was indeed a fatal application error). The strange thing was that the OVA deployed perfectly on my MacBook Pro running MacOS High Sierra with VMWare Fusion v10.x. After successfully deploying the VM on my MacBook, I copied the deplaoyed VM files to my Windows 10 laptop and opened the VM on VMWare Workstation Pro v14. And it ran without any problems. Posted on January 16, 2018 by Willem and filed under Annoying, Junos, Security, Software, Tips'n Tricks and tagged vSRX Juniper VMWare Workstation Fusion Fatal Application Error.